NEW YORK, NY--(Marketwire - February 2, 2011) - According to researchers at Jewish General Hospital in Montreal, robotic surgery is not only safer for patients, but also cost-effective for hospitals as opposed to conventional surgery. "Researchers found there was no difference in the outcomes between elderly and younger patients after robotic surgery," said Dr. David Samadi, a prostate cancer treatment specialist and robotic prostatectomy expert, who is also the Vice Chairman, Department of Urology, and Chief of Robotics and Minimally Invasive Surgery at The Mount Sinai Medical Center in New York City. "The bottom line is that robotic surgery is highly beneficial for the patient because they have a shorter hospital stay and very little pain and this is the same for the whole spectrum of patients," said Dr. Samadi, who's performed over 3,100 successful robotic prostate surgeries in his practice. Published in the Journal of Robotic Surgery, the study compared an open radical surgery, specifically a hysterectomy, with a robotic radical hysterectomy, and the relative expense to the hospital. The average cost of the open surgery was over $11,000, which included the hospital stay, surgeon and anesthetist fees, medications and other expenses. The robotic surgery cost just under $10,000, which factored in the expense of running the robot. A surgical robot, like Intuitive's DaVinci, costs from $1.5 million to $4 million. If the robot is used more frequently, the average cost per surgery goes down to just under $9,000. So what makes robotic surgery so much safer and cheaper? 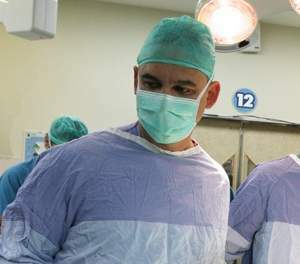 "The surgeon is able to use the robot to perform a more precise surgery that results in less blood loss due to enhanced magnification and visualization," said Dr. Samadi, a urologic oncologist who is also trained in laparoscopy and traditional open surgery, "The robot gives the surgeon increased flexibility, mobility and range of motion, since the robot has seven degrees of motion, versus a human's four degrees: up, down, left and right." Most importantly, robotic surgery only requires small incisions to insert the camera and instruments for the procedure, versus the larger incisions in traditional open surgery. With a robotic prostatectomy, the benefits include a high prostate cancer cure rate, but also reduced urinary continence and impotence. "This is due to reduced trauma to the delicate nerve bundles, which are responsible for these functions," said Dr. Samadi of this minimally invasive procedure. Ironically, in spite of the benefits, safety and cost-effectiveness of robotic surgery, many patients fear undergoing a surgery that is controlled by a robot. But Dr. Samadi counsels, "It is not the robot doing the surgery -- it is the surgeon controlling the robot. The robot is merely another tool that allows the surgeon to do his job well."